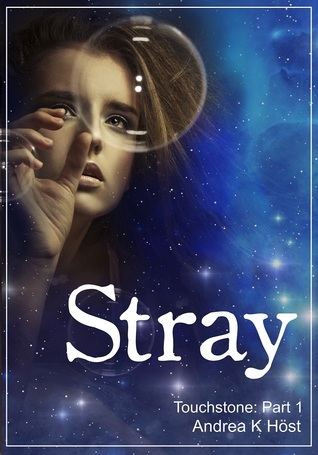 Stray by Andrea K. Höst is the first book of the new young adult science fiction fantasy Touchstone series. This first book was free on Amazon so of course at some point I picked it up and it did seem to still be free, at least in the U.S. The story is told from the prospective of the main character, Cassandra Devlin, in diary format. Seventeen year old Cass walked out on the last day of high school to find herself suddenly surrounded by a strange forest. She has no idea what happened or how she to there but Cass definitely has a will to survive and find her way back to her home in Australia. After quite a bit of time in this strange world on her own Cass is about to give up hope when she is rescued by the Setari. Finding the Setari are significantly more advance in their technology Cass learns she is what they refer to as a “stray” or someone that stumbled into a worm hole to end on the new planet. For a Kindle freebie I was actually a bit impressed with this young adult read in the fact it actually did have some creative content instead of the same old tropes you normally find in fantasy. However, for me I wasn’t a huge fan of the diary format with the telling instead of showing. The beginning when there isn’t a lot around was alright but when the aliens became involved I wanted a bit more. Overall though I would give this opener 3.5 stars as it did have some unique content. She is the winner of the Best Fantasy Novella Aurealis Award for her novella “Forfeit” (found in the The Towers, the Moon collection). Her novel “The Silence of Medair” was a finalist for the 2010 Aurealis Awards for best fantasy novel, while her novel “And All the Stars” was a finalist for both the 2012 Aurealis Awards and 2012 Cybils Awards.